Theatre maker and performer Conrad Murray brings Denmarked to Brighton Dome this April. Denmarked is an autobiographical performance sharing tales from the council estate of dodgy best friends, that rite of passage - your first arrest, dinner with your social worker and the Christmas dad went prison. Conrad’s performance is honest, raw and humorous. Firstly, for those who don’t know - can you tell us a bit about yourself and what you do? I'm a performer, and a theatre maker. I'm part of Beats & Elements, and I'm artistic director of the BAC Beatbox Academy. I beatbox and rap. I've always been trying to fuse hip hop with theatre. You’ve been working within theatre and performance for years. How did you get into it? My social worker who is an inspirational woman initially got me into applying for a drama course. South Thames college also got me into the BAC and I met another two inspirational women- Sarah Golding, and Liz Moreton. BAC is a hub for young and new creatives, I started experimenting with hip hop theatre. This was in 2002. Through going to the BAC I learned more about Uni and drama schools, and went to Kingston University. There I had a great lecturer called Trish. I created and directed a hip hop show in my second year, which toured the fringe and did a three-week run at the Battersea Arts Centre. Since then I've been directing workshops, and creating different projects. What can people expect from Denmarked? A hip hop/spoken word show, that is hard hitting, but has catchy tunes.I talk about my dad going jail, and the way that I felt about myself because of it. Denmarked is an autobiographical performance. In what way does your work provide an outlet for expression? What do you hope to convey? I talk about things that people don't usually talk about. Unusual crushes, different kinds of abuse and family members which get locked up. I want the audience to know my story and for them to realise that we all have stories, and we are more than our stories . We create them. I collate short spoken word pieces and look for narratives across them. I think about different stories from my past which are relevant to what I want to convey. In relation to DenMarked, I found stories that had parallels with Hamlet. How do you want people to feel throughout the performance? I want people to feel the drama, and to laugh. There are funny moments. What is the importance of sharing this story? Working class stories like mine are not usually told, and not by the artists themselves. I want people to realise we have the same struggles, and we are the same. What do you hope people will take from your show? That we create our own stories, and not to feel owned by our past the we cannot control. What advice do you have for all the young writers and performers – how can they use their voice to create visibility and change? I think you should write what you know, and be truthful. The truth isn't always easy, but it important. Break the rules and don't think about what you should say. You’re also running a workshop at the Brighthlem Centre - what are people going to learn? I want them to learn to Beatbox, and have fun. Can you tell us a bit about any exciting new projects or shows coming up this year? Frankenstein (by the Beatbox Academy) is going to go on tour, and I have an exciting new show based on J Ballards High Rise, which is about social housing and class called High Rise eState Of Mind with Beats & Elements. Beatboxing, live production , grime spitting and spoken word. The show is currently on at BAC, and CPT, and then going to tour to housing estates. Sounds Like Chaos are a great new young company. Conrad Murray will be running a free (but ticketed) workshop on 2pm on Sat 6 Apr at the Brighthelm Centre. Learn to beatbox, improve your vocal techniques and make your own music using nothing but your mouths - from hip hop and grime to R&B and dubstep. 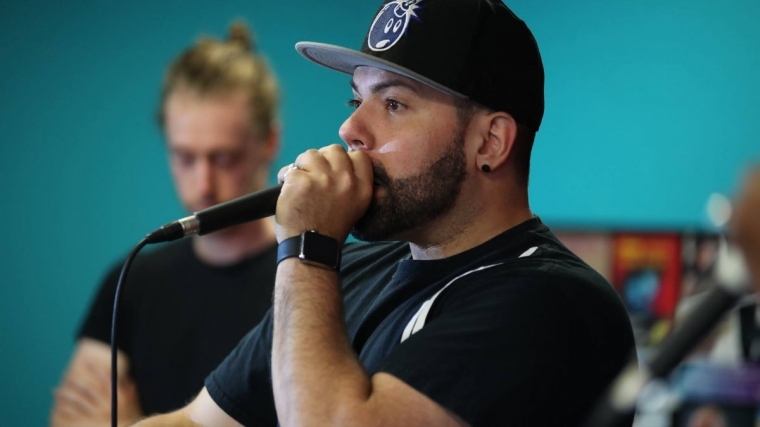 All levels welcome, whether you are new to singing and beatboxing or are a more experienced performer and beatboxer.